An elemental explosion for 40 points of fire damage, 40 points of shock damage, and half as much damage to stamina. 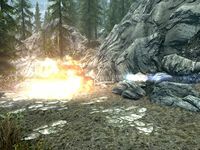 Elemental Blast is an expert level Destruction spell that deals magic (see Bugs) and shock damage, with half as much magic damage being dealt to stamina and half as much shock damage being dealt to magicka, over an area, upon projectile impact. The projectile deals magic and stamina damage, and burns targets, dealing 20% of the immediate magic damage and half as much stamina damage over 2 seconds, while the resulting explosion deals shock and magicka damage over 1 second. Elemental Flare, deals 40 points of magic damage and 20 points of stamina damage in 15 feet; targets receive a burning effect that lingers, dealing an additional 8 magic damage and 4 stamina damage for 2 seconds. Shock damage explosion enchantment (FExxx83F; ccBGSSSE014_EnchShockDamageExplosion01), deals 40 points of shock damage and 20 points of magicka damage for 1 second. Expert Destruction, reduces the spell cost by 50%. Aspect of Terror, adds 10 points of magic damage, 10 points of stamina drain, and raises the level that targets can be demoralized to level 109; if both the Aspect of Terror and Intense Flames perks have been unlocked. If this perk has been unlocked before the Augmented Flames or Augmented Frost perks, those perks will further boost this damage. Augmented Flames (Rank I), raises the damage dealt by the Elemental Flare effect to 50 points of magic damage and 25 points of stamina damage, with 10 points of magic damage and 5 points of stamina damage being dealt as additional damage for 2 seconds. Augmented Flames (Rank II), raises the damage dealt by the Elemental Flare effect to 60 points of magic damage and 30 points of stamina damage, with 12 points of magic damage and 6 points of stamina damage being dealt as additional damage for 2 seconds. Augmented Frost (Rank I), raises the damage dealt by the Elemental Flare effect to 50 points of magic damage and 25 points of stamina damage, with 10 points of magic damage and 5 points of stamina damage being dealt as additional damage for 2 seconds. Augmented Frost (Rank II), raises the damage dealt by the Elemental Flare effect to 60 points of magic damage and 30 points of stamina damage, with 12 points of magic damage and 6 points of stamina damage being dealt as additional damage for 2 seconds. Augmented Shock (Rank I), raises the damage dealt by the Elemental Flare effect to 50 points of magic damage and 25 points of stamina damage, with 10 points of magic damage and 5 points of stamina damage being dealt as additional damage for 2 seconds. This perk also raises the damage dealt by the Shock hazard to 18.75 points of shock damage and 9.375 points of magicka damage for 1 second. Moreover, it raises the damage dealt by the shock damage explosion enchantment to 50 points of shock damage and 25 points of magicka damage for 1 second. In addition, this perk raises the damage dealt by Disintegrate to 250 points of shock damage for 1 second; if the Disintegrate perk has been unlocked. Augmented Shock (Rank II), raises the damage dealt by the Elemental Flare effect to 60 points of magic damage and 30 points of stamina damage, with 12 points of magic damage and 6 points of stamina damage being dealt as additional damage for 2 seconds. This perk also raises the damage dealt by the Shock hazard to 22.5 points of shock damage and 11.25 points of magicka damage for 1 second. Moreover, it raises the damage dealt by the shock damage explosion enchantment to 60 points of shock damage and 30 points of magicka damage for 1 second. In addition, this perk raises the damage dealt by Disintegrate to 300 points of shock damage for 1 second; if the Disintegrate perk has been unlocked. Destruction Dual Casting, increases the spell effectiveness by 2.2x and increases the spell cost by 2.8x; if dual-casted. This raises the damage dealt by the Elemental Flare effect to 88 points of magic damage and 44 points of stamina damage, with 17.6 points of magic damage and 8.8 points of stamina damage being dealt as additional damage for 2 seconds. With all perks unlocked, this is by far the most powerful damaging spell in the game, dealing more than twice as much damage as regular expert spells for half the Magicka and being very hard to resist (see Bugs). Elemental Blast will damage both friend or foe in its area of effect, although, it will not damage the caster. With this in mind, take care when using the spell in the company of followers who tend to fight at close range, as even protected NPCs can be killed in this manner. For Deep Freeze Paralyze, Disintegrate, and Perk Impact Stagger to take effect, the spell projectile must hit the target, not just the explosion alone. Intense Flames does apply to the entire explosion. This spell has a base damage of 80 (per hand) (40 magic/40 shock) and is multiplicatively increased by augmented flames (50%) augmented frost (50%) and augmented shock (50%) for a total of 270 damage. (135 magic/135 shock) This is further increased by the aspect of terror perk which has an unusual interaction with this spell differing from how it affects other fire spells. It increases the spells damage by (10*1.5*1.5*1.5) (each 1.5* is from each of the augmentation perks) which is rounded to 33 increased damage for both the magic and shock parts of this spell increasing the total damage to 336. (168 magic/168 shock) The additional damage gained from aspect of terror is not increased to (15*1.5*1.5*1.5) even if the augmentation perks are taken first, the way usual fire spells are affected. Finally any of the 3 masks that increase either shock, frost or fire damage from the db dlc will increase the displayed damage by a flat 25%. Any of these masks increases the damage because this spell is flagged as a "magic" damage spell, so any of them increase the damage by that amount. This increases the total damage to 420. (210 magic/ 210 shock) This spells damage is also increased by the dual casting perk as most spells resulting in a dual cast of (420*2.2) 924 total damage. The most difficult part of these tests was figuring out the burn damage. The burn damage appears to be similar to all fire spells in that it is 20% of the initial damage. However, the initial damage that is used in calculation is only the "magic" damage component of the spell resulting in 20% of half of the spells damage, in other words, 10%. This causes the grand total of the spell to reach 1,016 damage, including the burn affect, when dual cast. The last component of damage is the disintegrate damage (assuming you have the perk) that will cause an additional 300 damage per spell whenever the target is at 15% max hp or lower. In any case, the maximum damage is 1,016. This spell actually deals magic damage, not fire damage, despite what the description claims. The main difference is that it ignores fire resistance (and weakness) and can only be countered by magic resistance, wards and spell absorption, though it looks like fire and scales with perks that improve fire damage. The listed damage only applies to the fire (magic) damage component. The shock damage component may deal different amounts of damage. The spell does not deal frost damage but still scales with frost perks. This spell will occasionally not deal its full damage if it is cast too quickly in succession. I have tested it many times and it seems you must wait to charge up the spell in your hands until the previous spell has made contact, else it will deal reduced damage.